The Colossus Piano App supports Apple's so called Inter-App Audio system (IAA), which allows to stream audio and MIDI data between apps in real-time. It was designed as lite-weight plugin system, similar to pro audio plugin system you might know from PC / Mac (i.e. VST, AudioUnit, RTAS), however with simplifications regarding usability for the iOS platform. 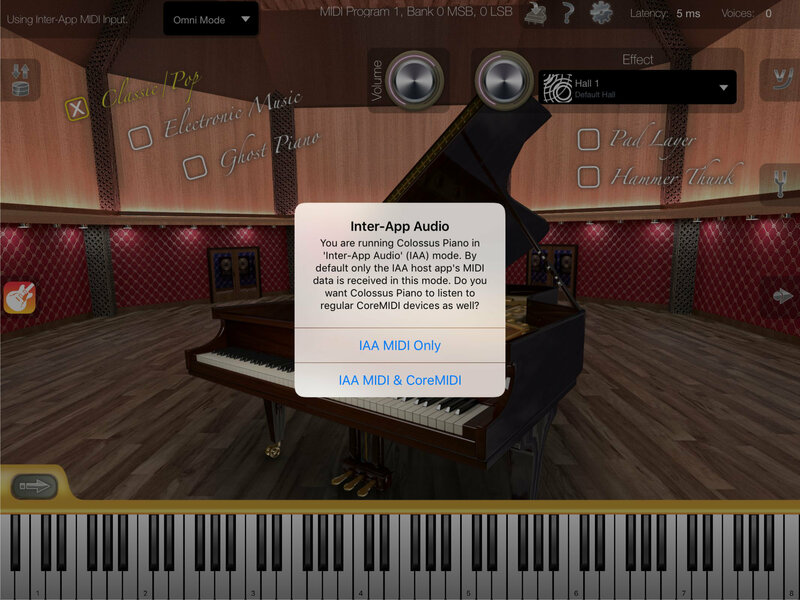 With the Inter-App Audio technology you can load Colossus Piano as virtual instrument directly into another third-party app, like into a DAW app such as Garage Band, Cubasis and many more. Essentially you can load Colossus Piano into any IAA compatible host app. Inter-App Audio requires at least iOS 7 or higher. This feature is not available for devices running an older version of iOS. Since the way how to load Colossus Piano as virtual IAA instrument depends on the IAA host app you are using, the following instructions describe as an example how it works with Garage Band. For other IAA host apps, please refer to their respective manual or contact the manufacturer of the host app for more information. Launch the Garage Band App. Scroll horizontally with your finger until you find "External". A new screen appears, showing you a list with all IAA instruments (and IAA effects) currently installed on your iPad / iPhone. Make sure tab "Instruments" is selected. Tap on the Colossus Piano app icon from the list. The Colossus Piano app appears now on your screen, showing you a dialog which MIDI inputs to use for Inter-App Audio mode. Select either "IAA MIDI Only" or "IAA MIDI & CoreMIDI" from the dialog, depending what kind of MIDI source you want to use in this IAA session. If you want Colossus Piano only to react on MIDI data which sent over the IAA connection between the two apps, then use "IAA MIDI Only", if you also want Colossus Piano to react on any MIDI data that may arrive from external MIDI equipment for example, then use "IAA MIDI & CoreMIDI" instead. 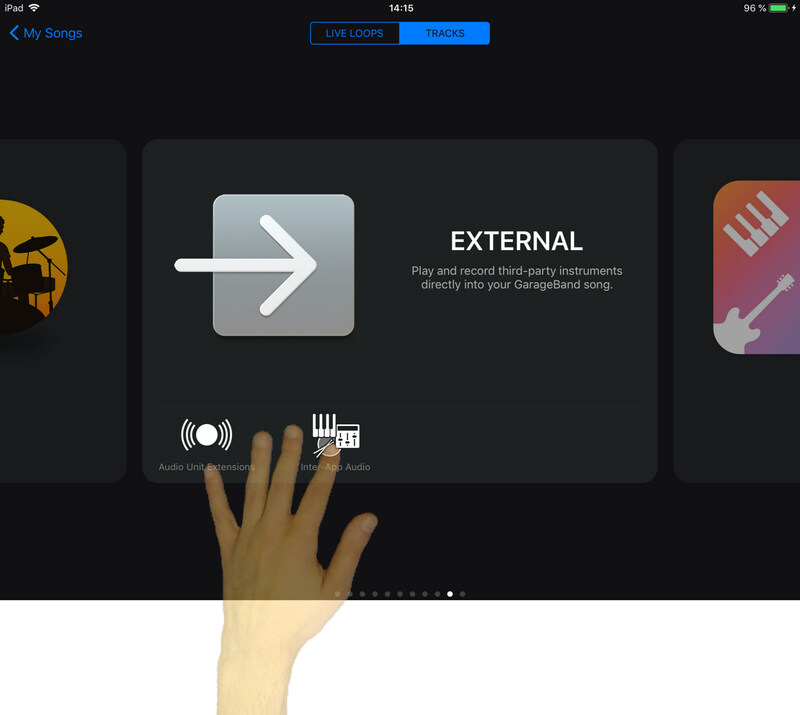 Quickly switch between the Colossus App and the Garage Band screen by tapping on their small app icons, as shown on the picture below. Setup your Colossus piano sound and start recording with Garage Band.